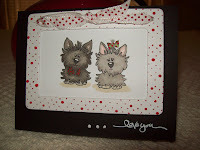 It was a great day when I got my new stamps from Stamping Bella. The first one I put ink to was this cute little "Butch and Mimi" stamp. I colored it with my Copics and just HAD to do a plaid bow tie on Butch and a polka dot bow on Mimi in the same red and green colors. I mounted it in a white chipboard frame and stamped it in Cranberry Crisp using the Itty Bitty Backgrounds stamp from SU. The ribbon is one that was taken off a Christmas gift last year. I ussed the Short and Sweet set from SU for the sentiment "love you" and accented it with dots of white 3D paint. I really like the simplicity of this card that focuses on the image (so cute)!! I hope you like it as much as I do.